During Vietnam, it felt like the war sat right on America’s doorstep. Today, we’ve largely disengaged from the terror our military commits. Let me tell you a story about a moment in my life I’m not likely to forget even if, with the passage of years, so much around it has grown fuzzy. It involves a broken-down TV, movies from my childhood, and a war that only seemed to come closer as time passed. My best guess: it was the summer of 1969. I had dropped out of graduate school where I had been studying to become a China scholar and was then working as a “movement” printer—that is, in a print shop that produced radical literature, strike posters, and other materials for activists. It was, of course, “the Sixties,” though I didn’t know it then. Still, I had somehow been swept into a new world remarkably unrelated to my expected life trajectory—and a large part of the reason for that was the Vietnam War. Don’t get me wrong. I wasn’t particularly early to protest it. I think I signed my first antiwar petition in 1965 while still in college, but as late as 1968—people forget the confusion of that era—while I had become firmly antiwar, I still wanted to serve my country abroad. Being a diplomat had been a dream of mine, the kind of citizenly duty I had been taught to admire, and the urge to act in such a fashion, to be of service, was deeply embedded in me. (That I was already doing so in protesting the grim war my government was prosecuting in Southeast Asia didn’t cross my mind.) I actually applied to the State Department, but it turned out to have no dreams of Tom Engelhardt. On the other hand, the US Information Agency, a propaganda outfit, couldn’t have been more interested. Only one problem: they weren’t about to guarantee that they wouldn’t send a guy who had studied Chinese, knew something of Asia, and could read French to Saigon. However, by the time they had vetted me—it took government-issue months and months to do so—I had grown far angrier about the war, so when they offered me a job, I didn’t think twice about saying no. Somewhere in that same year, 1968, I joined a group called the Resistance and in an elaborate public ceremony turned in my draft card to protest the war. For several years, I had been increasingly involved in antiwar activism, had marched on the Pentagon in the giant 1967 processional that Norman Mailer so famously recorded in Armies of the Night, and returned again a year or two later when, for the first time in my life, I got tear-gassed. For a while, I had also been working as a draft counselor with a group whose initials, BDRG, I remember. A quick check of Google tells me that the acronym stood for the Boston Draft Resistance Group. Somewhere in that period, I helped set up an organization whose initials I also recall well: the CCAS. Though hardly an inspired moniker, it stood for the Committee of Concerned Asian Scholars. (That “concern”—in case it’s not clear so many years later—involved the same war that wouldn’t end.) With a friend, I designed and produced its bulletin. As one of those “concerned scholars,” I also helped write a group antiwar book, The Indochina Story, which would be put out by a mainstream publishing house. Of course, there’s much that I’ve forgotten and I can’t claim that all of the above is in perfect order. Even at the time, life was a blur of activism. Nearly half a century later, I’m a failing archive of my own life and so much seems irretrievable. My intention here, however, is simply to offer a sense of how so many lives came, in part or in whole, to revolve around that war, while other things went by the wayside. It’s true that our government hadn’t mobilized us, but we had mobilized ourselves. Though much has been written about “dropping out” in the 1960s, this antiwar form of it has been far less attended to. So much of what I’m describing must seem utterly alien today. At a time when America’s endless wars might as well be millions of miles from our shores (and the national security state desperately needs a few “lone-wolf” Islamic terror types to drive home how crucial it is to our protection), it’s hard to remember how large the Vietnam War once loomed in our national life. In this age in which Americans have been demobilized from the wars fought in our name, who recalls how many people took to the streets how repeatedly in those Vietnam years, or how much the actions of our government were passionately debated from Congress to kitchens, or how deeply plagued and unnerved two American presidents were by the uproar and fuss? Who remembers how little the antiwar movement of that moment was a weekend operation and how central throwing some kind of monkey wrench into that war became to so many lives? Much of the tenacious antiwar opposition of that era, when thought about now, is automatically attributed to the draft, to the fact that young men like me were subject to being called up and sent thousands of miles from home to fight in a conflict that looked more brutal, despicable, and even criminal by the second. And there is, of course, some truth to that explanation, but it’s a very partial, dismissive truth, one that, for instance, doesn’t explain the vast number of young women who mobilized against the war in those years. 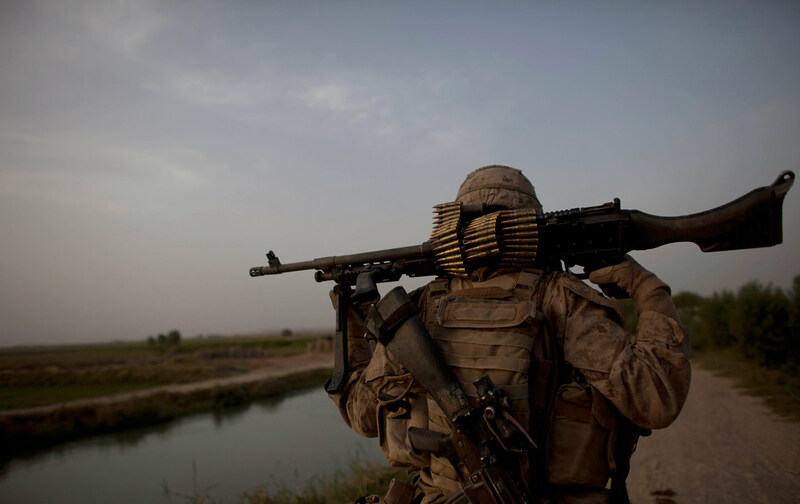 While the draft was a factor in the growth of war consciousness, it was hardly the only one. It’s easy to forget that a generation raised in the Golden Fifties believed the American system would work for them and that, if it didn’t, it was the obligation of the citizen to try to fix it. Those young people were convinced that, if you spoke up loudly enough and in large enough numbers, presidents would listen. They also believed that you, as an American, had an obligation to step forward, to represent the best in your country, to serve. Hence my urge to join the State Department. In other words, I came from a generation primed—in part by the successes of the Civil Rights Movement (when it seemed that presidents were listening)—to believe that, in a democratic country, protest worked. Of course, by the time the antiwar movement took off, it was hardly stylish to admit to such sentiments of service, but that didn’t make them less real. They were crucial to a passionate protest that began mainly with students but grew to include everyone from clergy to businessmen, and that, in its later years, would be led by disillusioned military veterans home from the country’s Southeast Asian battlefields. The importance of an antiwar movement that refused to stand down, that—while two administrations continually escalated the killing in Vietnam and spread it to Laos and Cambodia—never packed up its tents and went home, can’t be emphasized too strongly. Its refusal to shut up brought Vietnam, both literally and figuratively, to America’s doorstep. It made that grim war a living (and dying) presence in American lives—and no less important was what it made present. Somehow, from so many thousands of miles away, we were turned into witnesses to repeated horrors on a staggering scale in a small, largely peasant land: free-fire zones, the body count, torture, assassination, war crimes, the taking of trophy body parts, and above all the feeling that a spectacle of slaughter was occurring and we were responsible for it. We here at home had a growing sense of what it meant for the US military to fight a war against guerilla forces (which, at least on the left, came—unlike the Islamic insurgents of the twenty-first century—to look ever more heroic and sympathetic), with every means available short of nuclear weapons. That included bombing campaigns that, in the end, would outdo in tonnage those of World War II. The images of that time still remain with me, including Ron Haeberle’s horrific photos of the My Lai massacre, which appeared in LIFE magazine in December 1969, and Associated Press photographer Nick Ut’s iconic 1972 shot of a young Vietnamese girl napalmed by a South Vietnamese plane and caught in pain and terror running naked down a road. If you were in the antiwar movement in those years, you couldn’t help coming across testimony by American soldiers who had been in Vietnam and were ready to paint a nightmarish picture of what they and their companions had seen or done there. In the growing alternative or (as it was romantically termed then) “underground” press of those pre-Internet days, snapshots of unbearable atrocities were soon circulating. These undoubtedly came directly from soldiers who had snapped them, or knew those who had, or were like the servicemen—stirred to action by a growing military antiwar movement—who appeared at the Winter Soldier Investigation in 1971. There, they essentially testified against themselves on the commission of war crimes. Others similarly moved handed such photos over to alternative publications. In those years, thanks to the efforts of the antiwar movement, the Vietnamese—the dead, the wounded, the mistreated, as well as “the enemy” (“Ho, Ho, Ho Chi Minh, NLF Is Gonna Win!”)—seemed to come ever closer to us until, though I was living in quiet Cambridge, Massachusetts, I sometimes had the eerie feeling that Vietnamese were dying right outside my window. In the post-9/11 American world, that sounds both ludicrous and histrionic. You’ll have to take my word for it that I’m not exaggerating and that the sensation was visceral indeed. Which finally brings me to that clunky television set. At some point in 1968 or 1969, I got an old black-and-white TV. I have no idea whether I bought it or someone gave it to me. I do remember one thing about it, though. In that era before remote controls, the dial you turned by hand to change channels was broken, so I used a pair of pliers. Sometimes, I had it running on my desk while I worked; sometimes, it was propped on a chair, just an arm’s reach from my bed. (Remember those pliers!) And in the off hours when old movies filled schedules on secondary channels, I began to re-watch the westerns, adventure films, and war movies of my childhood. I no longer know what possessed me to do so, but it became an almost obsessional activity. I watched at least 30 to 40 of them, no small feat in the era before you could find anything you wanted online at a moment’s notice. Keep in mind that those films from the 1930s, 1940s, and 1950s—grade B-westerns, John Wayne-style World War II movies, and the like—were for me the definition of entertainment sunny side up. I had only the fondest memories of such films, in part because they were bedrock to the American way of life as I understood it. You always knew what to expect: the Indians (or Mexicans, or Japanese) would fall in vast numbers, the cavalry would ride to the rescue in the nick of time, the Marines—it hardly needed to be said—would advance triumphantly before the movie ended, the West would be won, victory assured. It was how it was and how it should be. Add in a more personal factor: my father had been in World War II in the Pacific. It wasn’t something he generally cared to talk about. (In fact, it made him angry.) But he often took me to such films and when we sat together in silence in some movie theater watching Americans fight his war (or cowboys and blue shirts fight the Indian wars), I felt close to him. In that shared silence, I felt his stamp of approval on what we were watching. If he and his generation were far more conflicted and less talkative about their war experiences than we now like to remember, they really didn’t need to say much in those days. After all, we kids knew what they had done; we had seen it sitting beside them at the movies. 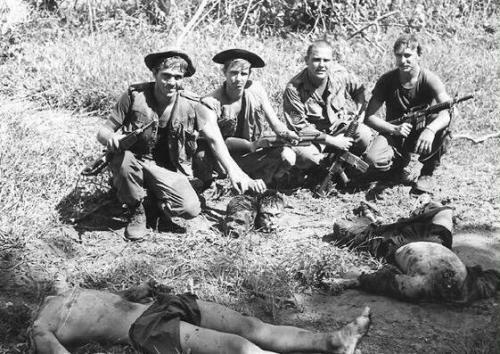 Imagine my shock, on looking at those films again so many years later—with that visceral sense of Vietnamese dying in my neighborhood—when I realized that the sunniest part of my childhood had been based on a spectacle of slaughter. The “Vietnamese” had always been the ones to fall in staggering numbers just before the moment of victory, or when the wagon train again advanced into the West, or the cowboy got the girl. Consider this my own tiny version of the disillusionment so many experienced with the previously all-American in those years. Our country’s triumphs, I suddenly realized, had been built on conquest and on piles of nonwhite bodies. Believe me, looking back on one of the sunniest parts of my childhood from that antiwar moment was a shock and it led me to produce “Ambush at Kamikaze Pass,” the first critical essay of my life, for the Bulletin of Concerned Asian Scholars. “Anyone who thinks the body count is a creation of the recent Indochinese war,” I wrote then, “should look at the movies he saw as a kid. It was the implicit rule of those films that no less than ten Indian (Japanese, Chinese…) warriors should fall for each white, expendable secondary character.” Almost a quarter century later, it would become the heart of my book The End of Victory Culture. In 2015, the spectacle of slaughter is still with us. These days, however, few Americans have that sense that it might be happening right down the street. War is no longer a part of our collective lives. It’s been professionalized and outsourced. And here’s the wonder of it all: since 9/11, this country has engaged in a military-first foreign policy across much of the Greater Middle East and northern Africa, launching an unending string of failed wars, conflicts, raids, kidnappings, acts of torture, and drone assassination programs, and yet Americans have remained remarkably unengaged with any of it. This is not happenstance. There is, of course, no draft. President Richard Nixon ended it in 1973 with the demobilizing of the antiwar movement in mind. Similarly, the military high command never again wanted to experience a citizen’s army reaching an almost mutinous state and voting with its feet or its antiwar testimony or its medals. Ever since Vietnam, the urge of successive administrations and an ever-expanding national security state has been to fight wars without the involvement of the American people (or the antiwar version of democratic oversight). Hence, the rise of the warrior corporation and the privatization of war. Especially after 9/11, a kind of helplessness settled over Americans left out in the cold when it came to the wars being fought in their name. In some sense, most of us accepted our newly assigned role as a surveilled and protected populace whose order of the day was don’t get involved. In other words, amid all the military failures of this era, there was a single hardly mentioned but striking victory: no antiwar movement of any significance proved to have staying power in this country. Osama bin Laden can, at least in part, be thanked for that. The 9/11 attacks, the shock of the apocalyptic-looking collapse of those towers in New York, and the loss of almost 3,000 innocent civilians inoculated America’s second Afghan War—launched in October 2001 and still ongoing—against serious protest. The invasion of Iraq would prove another matter entirely. That act of Bush administration hubris, based on kited intelligence and a full-scale White House propaganda campaign filled with misinformation, brought briefly to life something unique to our era: a massive antiwar movement that preceded the launching of the war it was protesting. Those prewar demonstrations, which stretched worldwide, ran into the hundreds of thousands and were impressive enough that the New York Times front-paged “public opinion” as the other “superpower” in a post-Cold War world. But as soon as the Bush administration launched its much-desired invasion, the domestic movement against it began to crumble. Within a couple of years—with the exception of small groups of antiwar veterans—it was essentially dead. In the end, Americans would generally live through their 21st century wars as if they weren’t happening. There would neither be an everyday antiwar movement into which anyone could “drop out,” nor a population eager to be swept into it. Its lack would be a modest tragedy for American politics and our waning democracy; it would prove far more so for Afghans, Iraqis, Yemenis, and others. Start with the drone, a robotic machine that guarantees one thing in the ongoing spectacle of slaughter: no American combatant will ever die in its operations, no matter how many Afghans, or Yemenis, or Iraqis, or Syrians, or Pakistanis, or Libyans, or Somalis may die when it releases its aptly named Hellfire missiles. From that heroic investigative crew, the Bureau of Investigative Journalism, we have an approximation of the casualties on the ground from Washington’s drone assassination campaigns across the Greater Middle East, and they run into the thousands (including hundreds of children) and lots of what might be called the mistaken dead. Keep in mind that the most basic drone attack of Washington’s wars in the Greater Middle East has been the “signature strike,” as it’s euphemistically known. These target not specific individuals, but groups on the ground that seem to fit certain behavioral patterns suspected of being telltale marks of terror outfits—particularly young men with weapons (in regions in which young men are likely to be armed, whatever their affiliations). Or consider US air strikes targeting the Islamic State’s forces in Iraq and Syria. Again, with the grim exception of one Jordanian pilot, there have, as far as we know, been no casualties among American and allied combatants. That shouldn’t be a surprise, since the Islamic State (like just about every group the US Air Force has faced in the 21st century) is incapable of bringing down a fighter jet. In the last year, according to a recent report, Washington and its allies have launched more than 5,700 strikes against Islamic State operations, claiming at least 15,000 dead militants. (Such figures, impossible to confirm on the ground under the circumstances, are undoubtedly fantasies.) The Pentagon has acknowledged only two civilian deaths from all these strikes, but a new study by Airwars of what can be known about just some of them indicates that hundreds of civilians have died, including more than 100 children. To offer one more example, since December 2001 US air power has obliterated at least eight wedding parties in three countries (Iraq, Afghanistan, and Yemen). According to my count (and as far as I know there are no others), just under 300 people died in these eight strikes, including brides, grooms, and celebrants of every sort. Each of these incidents was reported in the western media, but none had the slightest impact here. They went essentially unnoticed. To put this in perspective, imagine for a moment the media uproar, the shock, the scandal, the 24/7 coverage, if anyone or any group were to knock off a single wedding party in this country. And this just scratches the surface of Washington’s long “global war on terror.” Yet without an antiwar movement, the spectacle of mayhem and slaughter that has been at the heart of that war has passed largely unnoticed here. Unlike in the Vietnam years, it’s never really come home. In an era in which successes have been in short supply for two administrations, consider this a major one. War without an antiwar movement turns out to mean war without pause, war without end. Admittedly, American children can no longer catch the 21st century equivalents of the movies of my childhood. Such films couldn’t be made. After all, few are the movies that are likely to end with the Marines advancing amid a pile of nonwhite bodies, the wagon train heading for the horizon, or the cowboy galloping off on his horse with his girl. Think of this as onscreen evidence of American imperial decline. In the badlands and backlands of the planet, however, the spectacle of slaughter never ends, even if the only Americans watching are sometimes unnerved drone video analysts. Could there be a sadder tale of a demobilized citizenry than that?